This post may be of interest to a wider audience in the United States. A portion of the followers of this blog are in the U.S. The U.S. organization “Early Childhood Education Degrees” sent me a very informative and well-done graphic highlighting some impressive bilingual education numbers and student language demographics in the U.S.
6 million Americans speak a language other than English at home. Spanish Immersion numbers are significant (we hear all the time about how the Hispanic fact is more and more an integral part of the USA’s identity). But the fact that 22% of all immersion students in the United States are doing their studies in French particularly caught my attention. 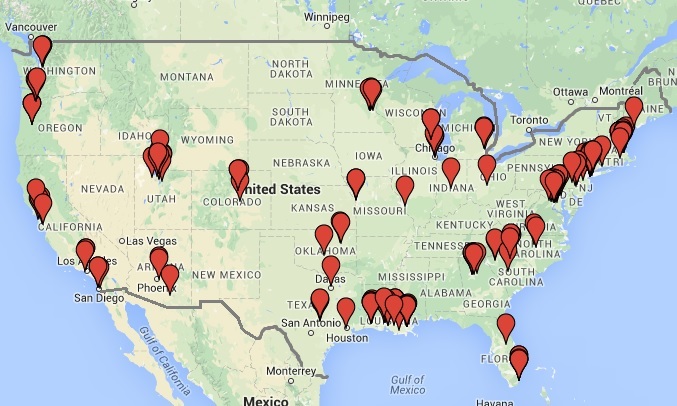 The USA has 200 French Immersion schools in 30 states and 116 cities. I was quite curious just how many “communities” (incorporated towns & cities) across Canada, but outside of Québec, were offering French Immersion programs. In other words, I was curious how many towns and cities exist across Canada in which Anglophone Canadians can complete their entire Kindergarden to Grade 12 education, completely in French, all within local schools. I did a bit of research online and made a few phone calls, but I was not able to find a “national” list so-to-speak. Nor was I able to find a complete list for five of the provinces; Newfoundland, Nova Scotia, New Brunswick, PEI and Saskatchewan. For those five provinces, I would have to sift through every single school board’s website to find to find all the individual towns and cities offering French immersion. I took a brief look, but there were so many that it would take me a week or more. But fortunately, the BC Ministry of Education, the Alberta Ministry of Education, the Manitoba Ministry of Education, and the School Board Association of Ontario had comprehensive lists of towns and cities in their respective provinces where French immersion is available. After I obtained the lists, I collated them into an excel document which I uploaded to Google Maps, and the results were astounding. Have a look for yourself below. Each dot represents an incorporated town or city offering French Immersion. In many cases, there is more than one school in each town (therefore, one dot can represent upwards of 2, 4, or more different French immersion schools). The one lone dot for Toronto represents more than 40 different schools alone. 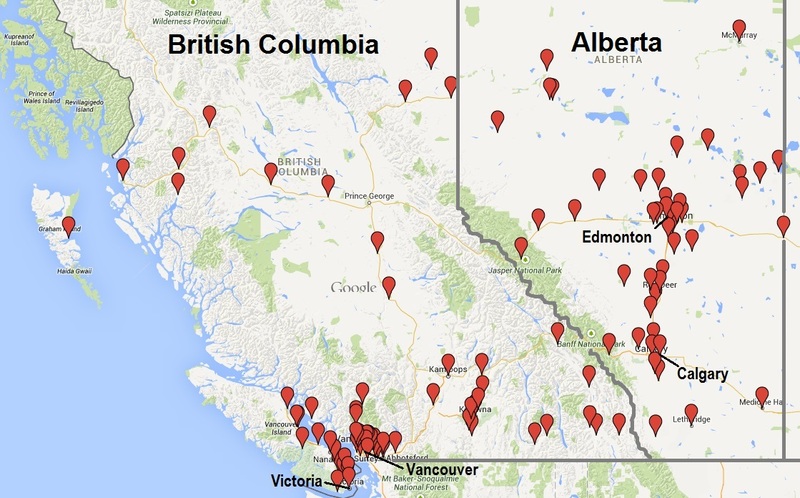 In just these four provinces, there were 984 Immersion programs. It makes you wonder how many different programs, towns and cities there are in total across Canada if you factor in all 10 provinces and 3 territories. I’m amazed at the change which has occurred across the country on the language education front over the last 20 years (and the demand for French from ordinary Anglophone parents which is driving this change) – wow! 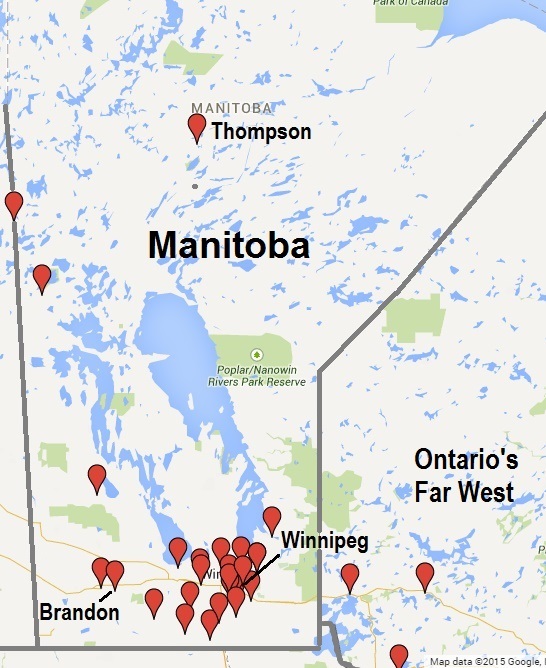 Manitoba’s towns and cities offering French Immersion – Click to enlarge. Ontario’s towns and cities offering French Immersion – Click to enlarge. Ontario’s portrait becomes even more amazing when you narrow in on Southern Ontario’s towns and cities. It makes you wonder which parts of Ontario do not offer kindergarten to grade 12 education all in French? – click to enlarge. It’s unfortunate government bodies for the remaining provinces do not provide publicly available lists (and instead requested me to me to check in with each school division). But from what I saw when I started browsing individual school division websites, a similar portrait exists in all the other provinces too. A French Language Curriculum Consultant from PEI wrote to me and provided me with the communities in PEI. She also mentioned that 21% of PEI’s entire student body is enrolled in French Immersion. Those are astounding numbers! I enjoy reading your blog. You are right when you say that many people are looking for cultural context to supplement their own French experiences and interests. I also listen to “C’est la vie” on CBC Radio, but other than your blog and “C’est la vie”, there are not many other places we can turn which are devoted to this subject (at least not in English). I’m from Truro, Nova Scotia. I am Anglophone, and I went through the French immersion program. 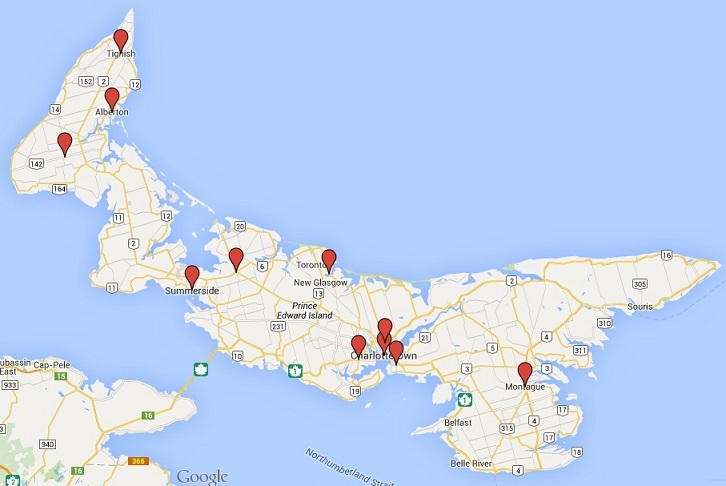 Truro is mostly Anglophone, but it has a few Acadians and an Acadian Francophone school system. But my French immersion school was a different school system than the Acadian Francophone schools. So my experiences in and out of school were with other Anglophones. But now that I’m out of school, I work with Acadians, and I insist that they speak only French with me and not English. There are so many of us who went through French immersion, and the first generation of the “immersion kids” are now adults, and the second generation is just now also graduating. By now, there must be thousands of us coming out of the program as adults across the country. I think only good things are going to come out of this, and it is changing Canada. My French is already very good because I did my education in French, but my accent can always be better. People tell me I have a bit of an Acadian accent when I speak. They also tell me I use many Acadian words which are not used in Québec. It is probably because of the Acadian influence in this part of Nova Scotia. I read your posts on different Canadian accents. It was quite interesting because people don’t ever talk very much about the different accents. Many Francophones I talk to are not even aware there are so many different accents. Most people I speak with think there are only three or four different accents, probably because much of the television they watch comes from New Brunswick or Quebec. My question is this: Because you have experiences with French in different regions of Canada, and because many people tell me I use many “Acadian French” words, would you have a list of French words used in other regions of Canada? You gave some Prairie French word examples in your accent series. I’ve heard there are sometimes different words used in Québec city and Lac St-Jean which are not used in Montreal, Moncton or other places. Would you have some examples or a list of different words from different areas? I generally only know Acadian and international French because I have not traveled to other Francophone regions of Canada. Thank-you for your email and your thoughts. I think you have hit on some great points which would be of interest to a good number of people. I’ll see if I can come up with a list of different words used in different regions over the next few days. Often the differences are not very big, and French vocabulary has standardized quite a bit over the past three decades (especially in Québec, but also in other regions across the country). But there are still some unique regional words and expressions which may be heard the odd time, depending on where you are. I particularly agree with you that it is quite interesting that the original 1980s & 1990s immersion students are now adults, with another generation not far behind them. I completely agree that this is bound to have an effect on the country as far as openness and new possibilities (regarding a whole host of issues). These numbers come from a report published by Statistics Canada entitled “French Immersion, 30 Years Later”. We always hear the usual statistic that there are 1 million “Francophones” (mother tongue) outside Québec. But really, if you’ve gone through the immersion program, you’re already part Francophone for simply living a huge part of your life in French (at least 7 hours every day during the school years). It blows my mind that nobody ever talks about those statistics. Think about it bud ! 20% of all Anglophone students in PEI… 4% of all Anglophone students in Alberta… 7% of all Anglophone students in Newfoundland! Those are mind-blowing numbers. And these numbers only speak to the students who were still in the school system. They do not count those of us who are now adults but who used to be in the program (keep in mind the numbers are already 15 years old – so all of those students are now adults, and there’s a whole new wave of students behind them in the immersion system). If you were to factor in current student numbers, plus graduated student numbers, plus the 1 million Francophones… where do we sit? 2 million? Even more? And it increases with every graduation, and every generation. Another statistic I also like to point out is that for every child in French immersion, there are likely two Anglophone parents who made the conscious decision to ensure that their children became bilingual. Thus, if you factor in “concerned parents” who are directly involved and devoted to their children’s & Canada’s bilingualism, as well as their openness to Canada’s and Québec’s Francophone culture, the above statistics for people making active efforts to keep French alive and well across Canada balloons to what… 4 million? That’s a HUGE part of the Canadian population making active efforts – all within 30 or so odd years. Parents count! I never would have been part of the first “experimental” immersion group had my parents not taken the active decision to place me and my bother in it (it even resulted in my mother taking French courses so she could understand what my brother and I were saying about her in French when we were kids – hahaha 😉 ). On this front, I’ve said many times before that Anglophone Canada is not the same country it was in 1980 or 1995. And then we haven’t even begun to count Anglophones who simply are learning French as part of a regular FSL program (ie: regular courses in an Anglophone curriculum), or as vocational courses, or as self-taught studies. They certainly cannot be counted out. Their efforts should be among those who are commended the most, since they’re the ones who tend to try to go the extra mile — and they’re the ones who have a steeper hill to climb. Add them to the equation, and that makes for a large chunk of the country. In a former life I was a diplomat posted to various Canadian Embassies abroad (I left the government a number of years ago to pursue my own business endeavours). The first and main operating language of one of the Canadian embassies in which I worked was French (the administration, our internal meetings, staffing, reports, emails, and the language in which we operated with the public and Ottawa). The diplomatic and locally hired staff therefore had to be fully bilingual (regardless if they were Francophone or Anglophone). One day we received a new transferee who grew up in a very Anglophone city in Canada (let’s call her Cindy, even though that’s not her real name). She only started to learn French after graduating high school. She took the odd course here-and-there in university, but most of her French came from her own studies during her own free time. I’ll say upfront that Cindy’s French was not the greatest, but she really tried hard, and I think she obtained this particular posting by demonstrating she definitely was the best qualified person for the job (and she was), regardless of rather poor French language skills. During her first few months at the embassy, owing to a lack of confidence in her own French skills, she would generally only speak English with the Francophone and fully bilingual Anglophone staff. But then one day something amazing happened which still blows me away many years later. The ambassador at the time had to make a very important and difficult decision regarding quite a sensitive and delicate matter. For the most part, he had already made up his mind (rather staunchly might I add) on how to deal with the issue. Nonetheless, he wanted to call a meeting of embassy staff to seek additional input and to cover any bases he may have missed. I, Cindy, and several others all met with the ambassador in the meeting room. After hearing him out for about 20 minutes (in French of course), he then asked everyone, one at a time, what their thoughts were on the issues and if he missed any details before he dropping the gauntlet and proceeded with his plans. The last person he asked was Cindy. She understood everything he said (her French comprehension was much better than her spoken French), but when she spoke up, all of a sudden she started to present her views in French. This was significant, because during any past meetings, she would only speak in English. Everybody’s ears perked up the moment they heard her try to speak French for the first time. She completely disagreed with much of what the ambassador said and she wanted to change his mind. Because she felt so strongly about the issues, she wanted to ensure she had the ambassador’s (and everyone else’s) full attention – and she felt that speaking French was the best way she could ensure she had it. I’ll be upfront in saying that because her French level was quite low, she struggled – big time – to get her many points across. The issues were complex, and she needed to talk in great detail if she were to convince the ambassador that her view of the issues and courses of action were the correct ones. I can tell you that the ambassador obviously did not agree with her, and a bit of a heated debate erupted between the two of them (I’m not sure he was happy that he was being challenged so ardently). All of us in the room were kind of in shock. Here was Cindy, who had a very difficult time speaking in French, taking on the ambassador (who’s first language was French) in a full head-on debate on a very complex issue — all in French. And what’s more, she was holding her own. She stumbled (quite a bit actually), and had to constantly search for words, but she would not relent. The Ambassador actually started to speak faster and faster as the debate went on, often cutting her off… He even tried to switch to English at one point in an effort to debunk Cindy’s points by making his standpoint very clear to her. But she simply would not relent. She refused to speak English, and she kept at him in French, giving it her very best shot. The rest of us around the table gave each other looks of surprise and disbelief. Cindy was amazing!! We had never seen this side of her before (let alone see her have the confidence in herself to push her French to the limits when things became heated). In the end, guess what happened… she won out, and she actually convinced the ambassador to take a change in direction. She fully explained every one of her points and reasoning (and there were many). It took a while because of her low French proficiency, but she eventually got there. We were all kind of stunned! Not because the ambassador changed his mind – he was a very reasonable man – but because Cindy would not relent and she did it all in French… for the first time ever… Wow!! After the meeting, everyone left the room except for me and Cindy (I asked her to stay behind for a second). There were not many Anglophones working at the embassy, and she was a friend of mine. I went over to her and told her how proud I was of her — not because she hotly argued with the ambassador for half an hour (I’m not sure I would have done that)… but I was proud that she gave it her best shot in French – which was very uncomfortable territory for her – and that she managed to pull it off beautifully. Judging from one-on-one comments which were said to me by others over the following days, I think everyone else was also equally impressed and proud of her too (including the ambassador). Later that evening, a bunch of us from work went out for drinks. Cindy was there, and she spoke French the whole evening (she never had the self-confidence to try to carry out whole conversations in the past). For the rest of her posting, she tried to speak French as much as she possibly could at work and with friends (we were in a “semi”-Francophone country and it was generally a “French-as-a-first-language” embassy after all). Her level of French was much better at the end of her posting than during the first few months when she did not have the self-confidence in herself to even try. This was a big lesson for me. It showed me that even if you don’t hail from a childhood in which you grew up speaking French, it truly is never too late to learn. Even with just an elementary level of French, you can still pull off some amazing feats if you really push yourself to try. The self-confidence that comes from that takes care of the rest. There are many Anglophones across Canada who are giving it there best shot. I sometimes really wish the media in Québec talked more about this because there’s this strange myth (and really, it is a myth) that French outside Québec is static or dead – when reality is actually pointing in the opposite direction (propogated more within fringe elements of the PQ & BQ, but not so much within QS, nor within the CAQ, Prov Liberals, Fed Liberals, or NDP). It’s interesting because I get the feeling the first two parties are trying to propagate this myth to score political points with the public to take up their causes. However, this myth can pose a problem if people begin to believe it. This is a tough one to resolve if several major influential spheres of Québec’s media do not give it due attention. Fortunately, however, from a media perspective, the tide may be turning on this front too. The new television station, UNIS (http://unis.ca/) is now being broadcast all over Québec (it went on air in September, 2014). It’s a Francophone television channel with studios across Canada, devoted to programming about Francophone life outside Québec (it’s quite an interesting channel and concept). It is owned by TV5 Québec Canada and is designated a category A station, meaning that all Canadian households (everywhere in Canada, including Québec) now receive it. TFO, http://www3.tfo.org/ (Ontario’s public Francophone television network) is also broadcast across many parts of Québec. It too gives a more realistic situation of French, Francophone and Francophile realities/changes outside of Québec and across Ontario (many of which I discussed above). Although these two television stations are not politicial in nature, we’ll see role they play to help debunk the myths about French outside of Québec. But hopefully this can help to encourage you and others to continue with your own efforts. It’s not necessary to become fully bilingual. Just keeping an open mind and learning about cross-cultural tidbits are sometimes more important than anything else, even if you’re not able to hold a conversation in French. People appreciate the efforts, and you end up feeling a deeper connection with your own country and the world at large But if you are able to pick up parts of the language, then all the more power to you. In the end, everyone charts their own course within the limits that time, interest and obligations allow for. But it’s nice to see that there are millions and millions of Anglophones across the country with an interest in, or who have interaction with Canada’s Francophone cultural and linguistic sphere. It’s very encouraging – and touching. I’m writing this post in French since Rick Hansen is not as well known to Francophones in Québec & Francophones elsewhere in Eastern Canada, but who has nonetheless had a very large impact on the rights of accessibility services for disabled people in Québec and all over Canada. The last few posts were related to Dolbeau-Mistassini and “Mario Pelchat” from the same city. The second last post was on the city of Port-Alberni. 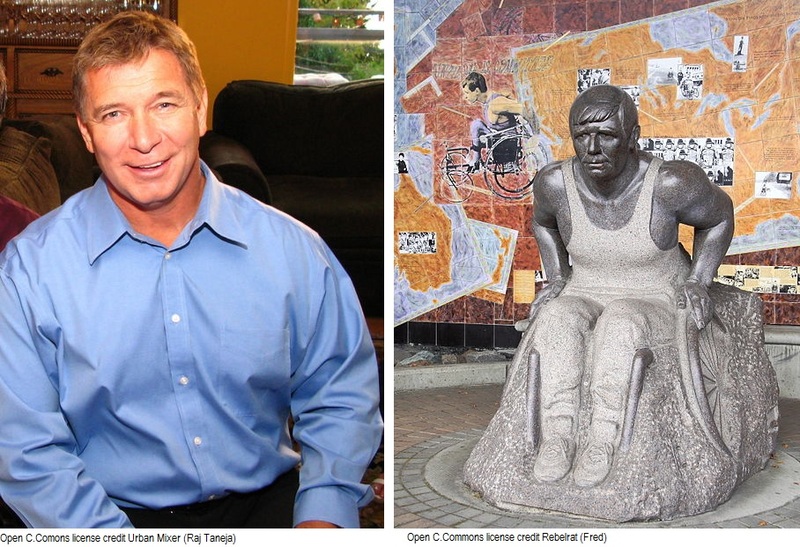 So let’s devote this post to Port-Alberni’s most famous son; Rick Hansen. J’écris ce billet en français car il s’agit un individu très reconnu au Canada anglophone, mais j’avais toujours l’impression qu’il n’était pas aussi bien connu au Québec et ailleurs au Canada francophone. Pourtant, il s’agit d’une personne qui a marqué à jamais le Québec, et le Canada dans son ensemble; Rick Hansen. Les derniers quelques billets parlaient de Dolbeau-Mistassini (QC) et Port-Alberni (C-B) — les deux villes qui étaient « jumelées », sous un prétexte assez injuste par le magazine MoneySense, comme les « pires » villes où vivre au Canada (un argument que j’ai tenté de déboulonner lors des billets précédents). Faisant partie de cette même série, j’ai écrit un billet sur Mario Pelchat, natif de Dolbeau-Mistassini. Et ce billet portera sur Rick Hansen, natif de Port-Alberni. Lors du moment que j’ai entendu parler de Rick Hansen pour la première fois, Terry Fox (qui avait la jambe amputée), était déjà très célèbre au Canada Anglophone pour avoir tenté de parcourir le Canada à pied afin d’amasser de l’argent pour la recherche sur le cancer (malheureusement, il n’a pas pu finir son parcours car il est décédé en route, suite au cancer, dans le nord de l’Ontario). Terry Fox était adoré par le Canada anglophone. En 1980, partout au pays, les Canadiens et les Canadiennes se sont unis pour l’encourager dans son parcours à travers le pays, et du même coup, c’était tout le pays (la partie anglophone du moins) qui était en deuil collectif lors de son décès. La première fois que j’ai entendu parler de Rick Hansen, j’étais très jeune — dans la troisième année d’école primaire je crois – à l’époque que ma famille vivais dans le nord-ouest de l’Alberta (sur la périphérie de la région de Rivière-la-Paix, une des régions francophones de l’Alberta). Tout comme Terry Fox quelques années auparavant, Rick Hansen était en train de parcourir le Canada, mais en fauteuil roulant. Hansen est devenu paraplégique suite à un accident de voiture à l’âge de 15 ans, et quelques années plus tard, il a gagné quelques médailles d’or et d’argent aux Paralympiques de 1980 et 1984. Inspiré par le parcours et la détermination de Terry Fox, il voulait lui-même parcourir le Canada pour amasser des fonds pour la recherche sur les traumatismes médullaires. 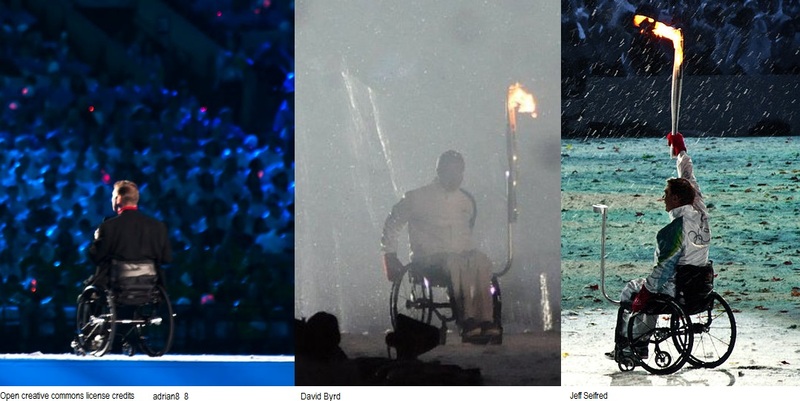 Pour des millions de gens à travers le pays, ce parcours subséquent de Rick Hansen incarnait la flamme qui avait été illuminée quelques années avant par Terry Fox. Les gens du pays se sont mobilisés massivement, et ils ont pris en charge sa cause comme rien d’autre au monde, mur à mur, et pas à peu près! Quelque part durant le trajet de Rick Hansen, une transformation inattendue s’est déroulée devant nos yeux. Le soutient qu’il a obtenu des citoyens ordinaires l’a incité à agrandir son trajet – et il s’est engagé à parcourir 34 pays à travers le monde. À l’époque, les yeux du Canada Anglophone étaient rivés sur lui – il était « le » héro du pays. Dans l’esprit des gens, son parcours constituait l’emblème de l’ère d’une nouvelle autonomie et intégration dans la société pour les personnes handicapées, tout autant qu’une levée de fonds pour les traumatismes médullaires. Ce changement de perceptions de société était une transformation majeure. Il faut se rappeler que le début, ainsi que le milieu des années 1980 étaient elles aussi des époques de changements sur plusieurs fronts; telles l’interdiction de fumer dans les bureaux et des lieux publiques, la nomination des premières femmes en tête des corporations majeures, et dans le cas relié à Terry Fox et Rick Hansen, il s’agissait de l’acceptation et l’inclusion des personnes handicapées comme membres complément fonctionnels de la société, normales et pleinement intégrés. Partout au pays, y compris au Québec, des politiciens, des gouvernements, des organismes à but non lucratif, et des corporations ont relevé le défi. Le mouvement a pris des proportions épiques. Ils adoptaient des mesures législatives pour protéger les droits des personnes handicapées et ils ont pris des mesures pour s’assurer que les édifices partout étaient accessibles à ces personnes. Les corporations et institutions ont institué des campagnes d’équité en matière d’emplois, alors qu’avant, les personnes handicapées étaient souvent exclues de plusieurs postes de travail. Alors, peu importe où vous êtes au Québec ou ailleurs au Canada, la prochaine fois que vous voyez une rampe pour fauteuil roulant, des portes automatiques pour personnes handicapées, des autobus avec accessibilité aisée, des panneaux en braille, ou même des coins de trottoir avec bordures déclinées pour accessibilité aux fauteuils roulants, vous pouvez en grande partie remercier Rick Hansen – car ces mesures n’étaient pas monnaie courante avant le mouvement des droits auquel il a grandement contribué. Mais pour moi, j’étais trop jeune à l’époque pour reconnaître la signification et l’impact du « phénomène Rick Hansen ». Lorsqu’il faisait son parcours à travers le Canada et un peu partout au monde, je me rappelle que notre professeur au primaire a agrafé une grande carte du Canada au mur de la salle de classe. Chaque matin, sans exception à la même heure, elle rassemblait tous les élèves de la classe devant la carte, et chaque jour elle choisissait un(e) élève différent(e) qui devait apposer une punaise sur la carte pour indiquer l’endroit où Rick Hansen s’est rendu au cours de la journée précédente. On suivait son trajet jusqu’à la fin. Rick Hansen était surnommé « L’homme en mouvement », et sa tournée épique était baptisée « la Tournée mondiale de L’homme en mouvement ». En été 1986, malgré mon jeune âge, j’ai pu finalement saisir le sens et l’ampleur de l’importance de Rick Hansen. C’était l’été de l’Expo 1986 à Vancouver (la seule autre fois que le Canada a accueilli l’Expo internationale depuis l’Expo 1967 de Montréal). Mes parents ont embarqué moi et mon petit frère dans la voiture pour conduire les 12 heures du nord de l’Alberta jusqu’au au sud de la Saskatchewan pour laisser mon frère à la garde de mes grands-parents, et mes parents ont repris la route, moi et eux seuls, à destination de Vancouver (20 heures de route de plus) pour assister l’Expo’86 pendant une semaine. Je me souviens clairement que partout où nous allions au terrain de l’Expo, tout ce qu’on voyait étaient des images de Rick Hansen, et on y entendait à répétition la chanson thème de sa tournée. « L’homme en mouvement » est devenu « le thème » de L’Expo’86. 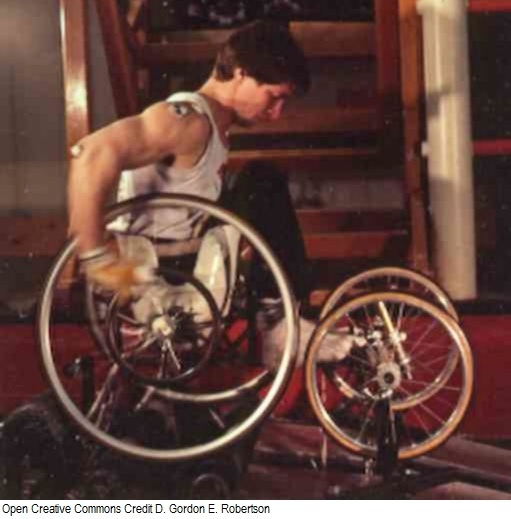 Depuis les années 1980, la vie à Rick Hansen a connu bien de vicissitudes, parfois de façon très publique. Mais il a fait un retour en force durant les Olympiques de Vancouver en 2010. C’était un grand moment de fierté d’un océan à l’autre. Tout comme Dolbeau-Mistassini serait très fier de Mario Pelchat, j’en suis persuadé que Port-Albani serait aussi fier de Rick Hansen. Since we’re still in the series of posts which talks about Dolbeau-Mistassini, let’s talk about one of the city’s native sons: Mario Pelchat. Pelchat was born in Dolbeau-Mistassini. He moved away as a child, but still grew up in the region not far from Dolbeau-Mistassini. Perhaps one of the best ways to describe him is by saying he’s possibly Québec’s own version of “Michael Bolton”. I suppose there are a number of comparisons to be made. Both sing very similar styles of music – “pop rock ballads”. Both were huge in the 1990s and saw a good deal of career success in the 1980s (and they’re still both very famous to this day). Both garnered international fame (Mario Pelchat became quite famous in many Francophone countries, such as France, Switzerland, Lebanon and Belgium, whereas Michael Bolton became quite famous in Anglophone countries, such as Canada, the UK and Australia). Both began their careers quite young (Pelchat was a star at a much younger age when he was in his late teens and early 20’s, capturing a solid fan base of an entire generation). And just like Michael Bolton, Mario Pelchat has the ability to sell out concert halls everywhere he goes (even to this day). Actually, if you’re learning French, perhaps MarioPelchat’s song would be perfect to help with your studies. Because he sings pop rock “ballads”, his songs and the pace of the lyrics are quite slow and well enunciated. They just might be the type of lyrics which are conducive to learning French. Do you know Mario Pelchat? It’s funny to find out what first comes to mind when people around the world think of your country – and those impressions certainly are not static, and tend vary from place to place. In Lebanon, Mario Pelchat is definitely one of the first Canadian subjects people think of – go figure! He is also associated with the biggest of the big music names in Québec and in the French world (he’s certainly part of that small inner circle of the biggest names), many of whom have already been featured in this blog. You would have to search far and wide to find someone in Québec or Francophone Canada who does not know Mario Pelchat. He has been on our TV screens and on the radio for the past 30 years. Pelchat has also sung a good number of French country songs (you may recall the earlier post on Québec country music which I wrote. Click here for it). One of his more popular country songs (a duet with Paul Daraîche) is Rosalie. Anyway, check out his songs and videos… particularly Je ne t’aime plus. His work is available for sale through various venues. Please stick to official sites and do not pirate (our artists are part of our cultural fabric).